I'm still playing catch up on a few challenges from this past week, but I've also gotten a jump start on one for next week! I guess sometimes it pays to procrastinate! 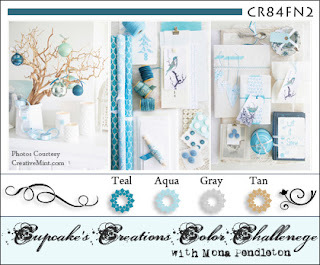 I love Mona's inspirational Color Challenges, and wanted to play along, so I combined this weeks Cupcakes Creations Color Challenge with the fun JUGS 58 Sketch. I created the Rose, using a morphed take on the Tim Holtz Grunge Roses, as I used the Heartfelt Creations Posy Patch Die Cut and some SU DSP that coordinated with Mona's color story. 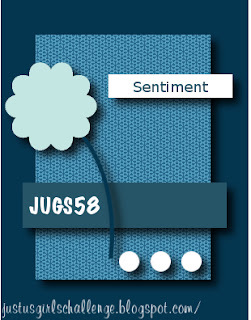 I needed to add in the Teal and Gray to go along with the colors - hmm where to add that? Then I remembered in a past TJNL there was the Designer Souffle' Technique, so I morphed that be using my Teal Marker, adding some color to the open areas of the DSP. The Gray I worked in with some Antique looking Gems. I'm also entering this into the Simon Says Stamp and Show Something Shabby Challenge. Beautiful! Love the flower it's lovely! 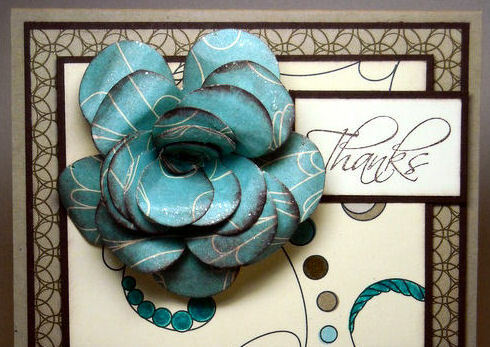 Beautiful card, I love the layout and how the flower lays on it. This is so beautiful! And that flower is just perfect!!!! Gorgeous flower!! Love how you combined the two challenges into one fabulous card! This is so beautiful, Lisa! The colors are so classy...and I love your choice of the designer paper. As for the flower....well, it rocks! Awesome job, Lisa, with combining the two challenges and coming up with a beauty! Wonderful colors - love how you added the teal. Great take on the shabby challenge too. 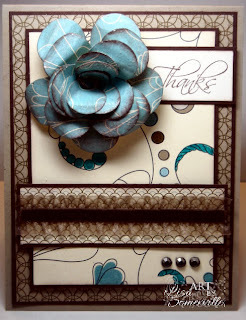 So happy you could join in the shabby fun with us this week at Simon Says Stamp and Show! Oh my Lisa ~ I love this card...and that posy rose is just stunning...makes me want to go to HC and buy that die, of which I have several...you did such a great job with it!!! TFS! This is an absolutely beautiful card! I love the teal color...why did I give away all my retired SU teal product??? I will have to make a rose using dsp. Your rose is stunning. Gorgeous, just gorgeous, Lisa, as is everything you create! Love that rose and all the colors on this are my fave! Thanks for joining the Simon Says Stamp and Show Challenge! WOW your card is stunning, that rose is beautiful, I need to give those little beauties a try. Excellent work. Lisa this is Marvelous! i love that big oversized rose! Inquiring minds want to know how it came to be! The dp is gorgeous. I love how you added the color to this. I really like your stem. I think that is so eye-catching! Awesome job! As usual for you! Most EXCELLENT artwork! Wonderful take on the JUGS challenge! Wow this is just beautiful - I love your take on the colors and the flower is just divine! Thanks for getting sketchy with JUGS this week. We appreciate it. Wow, how beautiful, luv the posey and the colors! OH MY! That flower is LUSH! LOVE LOVE LOVE it, Lisa:) Beautiful card! *THUD* That is my chin, hitting the floor!!! How awesome is your card?!?! Love it - every single little detail is so perfectly made and placed! I am in awe!!!! Gorgeous work :) Thanks so much for playing along with Just Us Girls!!! We always appreciate your support!!! Beautiful job! I love those "tim holtz" style roses, I've been making alot of them lately! Nice job, thanks for playing along with Just Us girls! Love it LIsa! This is such a pretty card and your Tim style rose turned out great! Thanks so much for playing with Just Us Girls this week! I love the colors and great job on the rose!